After migraine city last night, this morning was difficult to pry myself from bed for an early start but the market was calling! Bundled into the taxi, I was in autopilot until I finally got to eat – empanada woop! First stop was the animal market. It’s not something I would have chosen to go to on my own, but I have never been to one and it’s definitely not a tourist spot so I was up for checking it out. I’m not sure it was really for me. I found it upsetting seeing guinea pigs piled into mesh bags, small chicks dropped into brown paper bags, hearing the pigs squealing and rabbits picked up by their ears….I was glad to move onto the main market. The main market was awesome! It was streets and streets of stalls, so colourful and different. I even bought a few small things (mostly gifts but still!). You could spend hours on end following the twists and turns off the various streets. The vibe was great and a lot of the areas weren’t overwhelmed with tourists… Probably as we were so early! Cecilé and I managed to lose Remi and after looking for over an hour we decided to go back to the hotel to wait for him there! Back at the hotel, Remi was there! I decided that as I was still feeling a bit wobbly and unwell that I would start to head on to El Quinche ready for my adventures tomorrow. 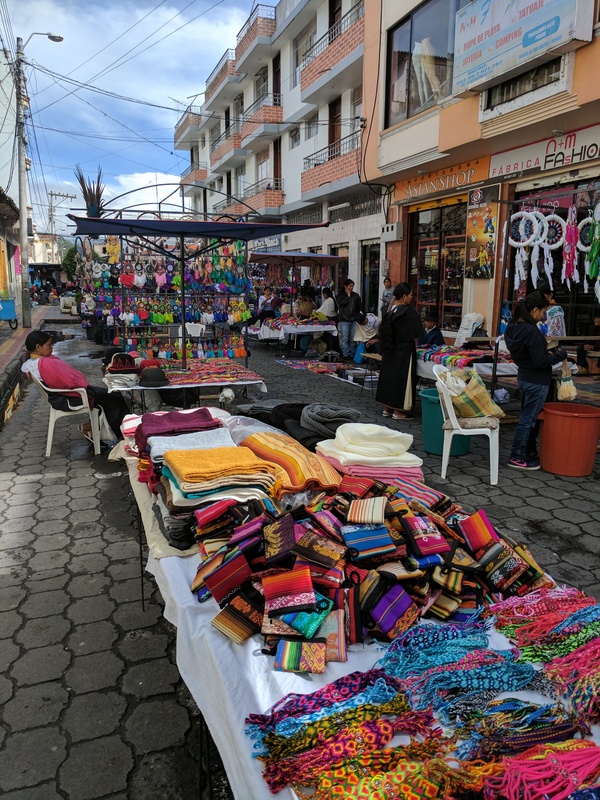 I hopped on the bus to El Quinche and vegged out for two hours until I arrived. Once I got there, stress began….I couldn’t get a taxi to my hotel…. apparently it was no where nearby…..cue meltdown. I was stood in the middle of my street with all of my bags and nowhere to go. As panic was starting to rise, the first taxi driver returned telling me there was a mistake and he could take me. I almost passed out with relief! Five minutes later I was safely installed in my hotel room. What an awesome place, the lady is lovely! I was invited to have dinner with her family where I had a go with my very unimpressive Spanish. I have now crawled off to bed for an early night ready for my super early pickup for my flight….here I come 4am!